Gas Detector Field Adjustable Alarms: Are you sure you want that? Are you really sure you want someone to change the setting in a toxic gas detector that determines whether you're notified of a hydrogen sulfide or chlorine gas leak? At first glance field adjustable settings may seem like a great feature; flexible, modular and easy to do too. But be careful, it may be too easy. If I'm responsible for the safety of others, I don't want a guy like me to have the ability to change alarm levels. I'm cautious and careful, but occasionally I transpose numbers, or may skip a step in a procedure due to any number of things that are happening on a bad day. That's a dangerous combination with a gas detector. Beside simple human error, other risks with field adjustment include deliberate tampering, and even worse, settings made by authorized personel with good intentions who don't have a full understanding of a system or instrument. Things can go wrong so easily and in so many different ways, especially with complex systems. I marvel at how the unlikeliest, once in a life time sequence of events can somehow come together to cause a tragedy. For these reasons and more, you need to minimize the potential for error or malfunction in your gas detector. It's important to remember how dangerous these gases are and to be aware of how the body responds to them. Carbon monoxide is colorless, odorless, and tasteless. Overexposure symptoms can be mistaken for food poisoning or the flu. A victim can slip into unconsciousness and away without ever realizing what happened. Our ability to smell some gases can be diminished by prolonged or excessive exposure. Our approach to gas detection at Foxcroft incorporates the KISS principle, Keep It Simple Stupid, coined by engineer Kelly Johnson of Lockheed Martin. Even though Foxcroft toxic gas detectors include the finest gas sensors available, we've chosen not to provide field adjustable settings or or risk transmission interference with wireless sensors. We've avoided a high level of complexity in operation, installation and calibration to minimize the potential for error. While we offer "non-standard" operating ranges and custom alarm levels upon request for applications not related to personal safety, we don't make them field adjustable. With more features being developed through rapidly changing technology, we need to remember the purpose of toxic gas detectors: accurate, reliable gas detection and notification, all the time. Before committing to a detector with adjustable alarm levels or any other "advanced features", determine if they're truly needed for your circumstances or the application. If so, does the detector include a means to prevent improper alarm settings or other human generated errors? 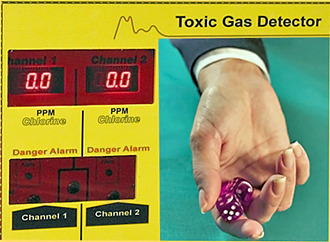 In any event, develop a gas detector protocol that includes plenty of checks and balances. To maximize your margin of safety, keep it simple to minimize the number of things that can possibly go wrong. The gases you're working with may not give you a second chance.